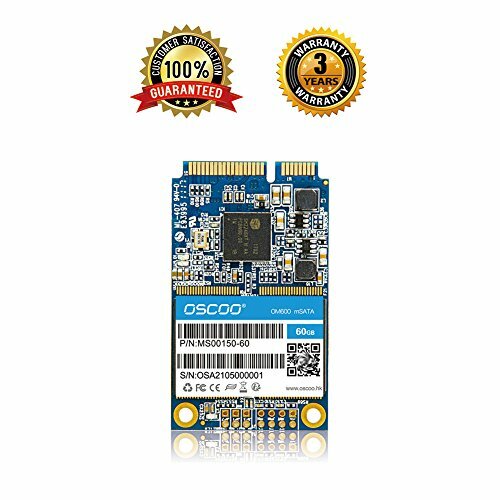 NOTE: Due to the use of mSATA interface specification, When using a mini SSD solid state drive，Need identify the motherboard or laptop computers equipped with the mSATA interface slot. Low power consumption,no noise,compatible with Notebooks Tablets and Ultrabooks. ECC Intelligent error correction, enhance the durability and extend read and write speed. -36 months worry-free product guarantee for every purchase from OSCOO. 【 Features 】：With lifetime equalization technology, support DevSleep mode, support for BCH, ECC. Fast, durable, ultra-quiet, shockproof, falling preventing, low power consumption. 【Compatibility】：Windows XP/ 7/8/10, Linux, Mac OS. Use for Mini pc, Notebook, PC, POS Machines, All-in-one PC, Advertising Machines, Network Terminals, On-board Computers, Video Surveillance, Medical products and Equipment Storage. 【Warranty】: 3 years warranty and free technical support. If you have any questions about this product by OSCOO, contact us by completing and submitting the form below. If you are looking for a specif part number, please include it with your message.